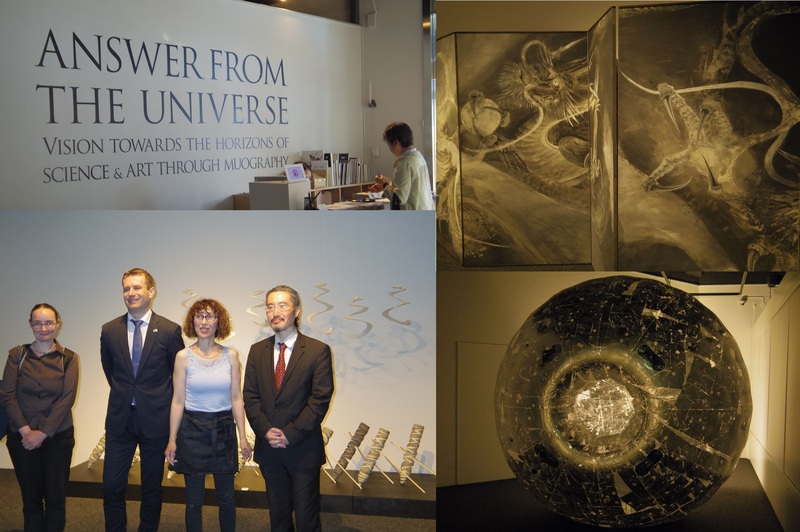 With the support of the Hungarian Embassy to Japan, Wigner Research Centre for Physics (Hungarian Academy of Sciences), the Earthquake Research Institute of the University of Tokyo, companies Sharp and Maxell, Kansai University and the CMS experiment’s art@cms program, Tama Art University is hosting a unique science and art exhibit named “Answer From the Universe Vision Towards the Horizons of Science and Art Through Muography”. 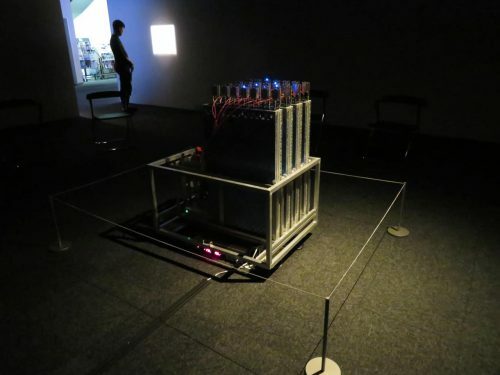 The exhibit is a mix of traditional Japanese art and international art inspired by muography and particle physics. 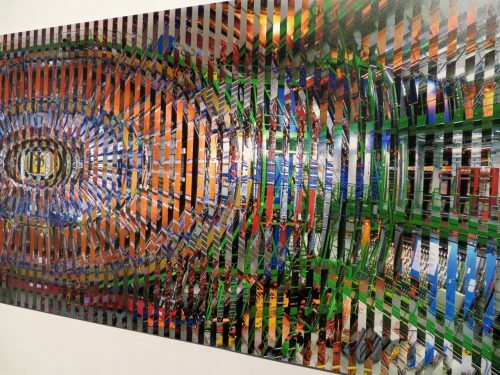 It is a diverse mix of mediums from traditional painting, Japanese ink painting on wooden screens, gold leaf, photography, digital painting and sculpture. 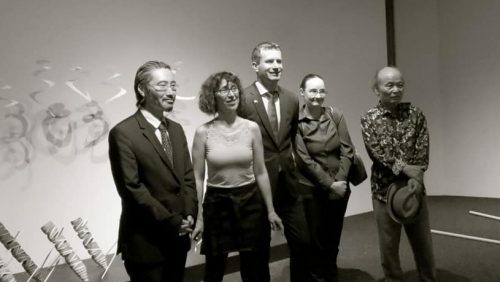 After the opening, a special invitation only workshop was introduced by the curator of the exhibit, Takeshi Fuchida, with talks given by the Hungarian Ambassador, Hiroyuki Tanaka, the President of Tama Art University, and other professors of Tama Art University to discuss the future of international, academic and interdisciplinary cooperation. 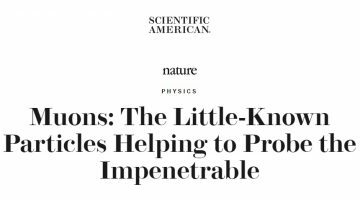 A schedule of public events follows with lectures by Hiroyuki Tanaka, Agnes Huez, Kenji Sumiya, and Fredrico Iacobucci on a range of art and science topics. 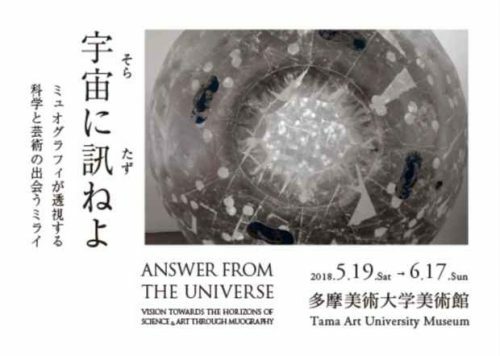 Featuring 15 artists from Japan, Europe and America, this exhibit of muography inspired artwork is being held at the Tama Art University Museum from May 19 to June 17, 2018. Tama Art University is one of the premiere art schools of Japan and is located in the Tokyo Metropolis, Japan. 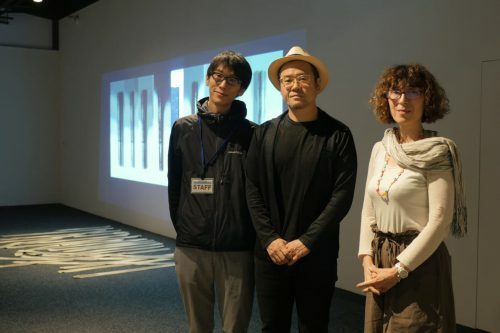 Curator Takeshi Fuchida had the challenge of creating a dialogue between traditional and modern Japanese art with international art, both traditional and modern. 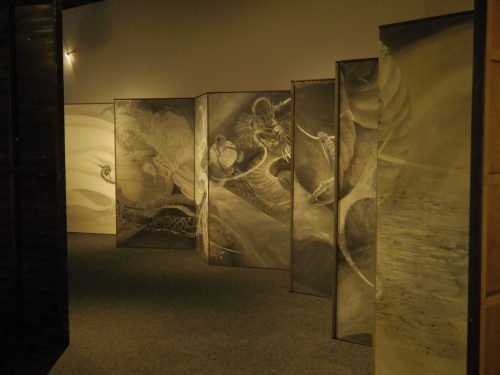 The Hungarian ceramic artist Agnes Huez, during her artist residency at Tama Art University, created a multimedia performance art piece in one of the ground floor rooms incorporating projected video and sound art accompanying sessions of ceramic art construction conducted live in front of audiences. Agnes Huez working with wet slabs of clay in the process of constructing her installation piece. In an adjacent area, the visitor experiences a chronology of Japanese art, starting from the most traditional forms and the mentors of the previous generation to more contemporary Japanese visions and the next generation of artists. 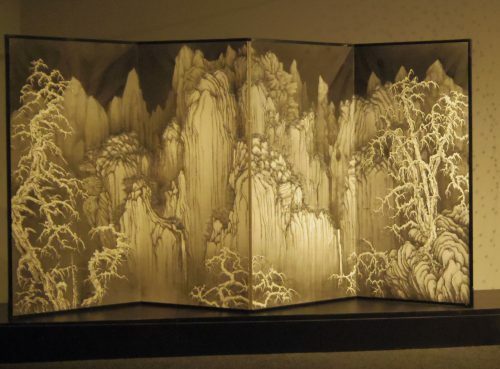 “Snowy landscape in the Northern Song Manner”, a four panel screen created with sumi ink on silk by Matazo Kayama (an artist awarded the Order of Culture and a former professor at Tama Art University) was displayed alongside younger generations of Japanese artists. 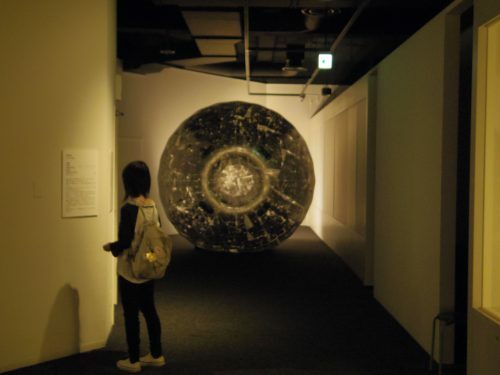 At the far side of the room around the corner, visitors are confronted by an enormous sculpture by Yuji Ishikawa, a young graduate of Tama Art University, called the “Muographic Celestial Globe”. There is also a traditional Japanese screen from Yoshiyuki Nakano and a more contemporary wooden screen decorated with gold leaf by Keizaburo Okamura. 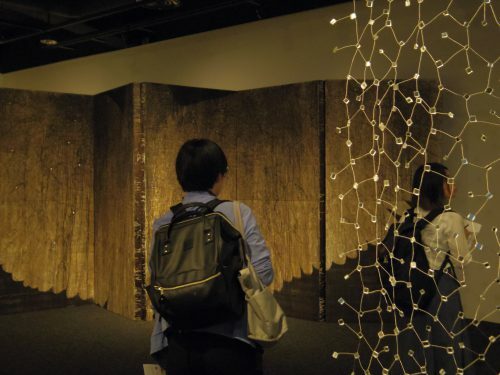 Gold leaf is also featured in the works of Shinji Nakabori, another graduate of Tama Art University. Moving upstairs, the art takes on a more international flavor with photography, traditional oil paintings, digital and sculptural art. American and Japanese artists from the special Kansai University collaboration are exhibited along with a pieces inspired by the CMS detector (an experiment that is connected to the enormous particle collider LHC at CERN, Geneva) by Michael Hoch, an Austrian born photographer and physicist and founder of art@cms. Visitors also have the chance to see the muography detector itself, beautifully lit in a darkened room. This detector was designed by Toshiyuki Kita, recently honored with the Commendatore from Italy. Along the back wall, a beautiful Sharp digital 4k monitor showcases Kansai University’s new museum display technology. 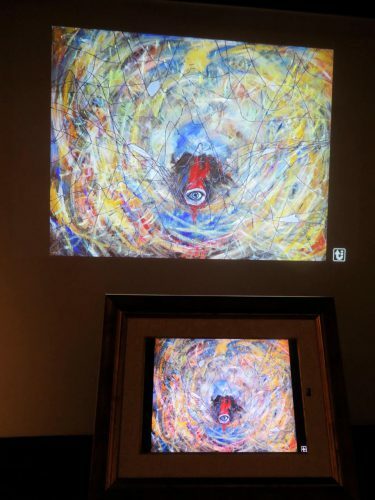 Oil paintings from Hiroshi Nakajima, sculpture from Norman Cook, a video art project by Otograph (Takashi Iura and Sashiyo Oshima), design projects from Kansai University and digital paintings by Sara Steigerwald (in collaboration with Hiroyuki Tanaka) are also presented. Participants in the upcoming Muographers 2018 conference which will be held at the IIC will have an opportunity to see some of the work that was shown at this show along with other newer works, including the Muography Symphony composed by Fredrico Iacobucci.